Lovely to learn more about you and your designs! 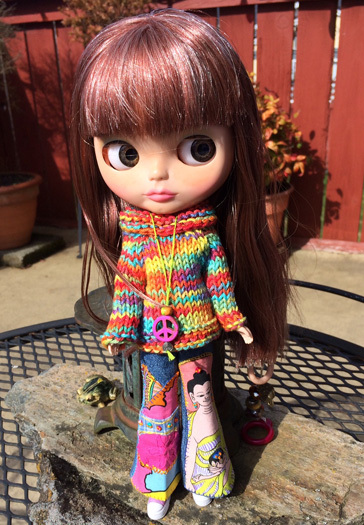 Mizzfitzdolls this was a wonderful story to read and to get to hear about your creative process. I look forward to following you on Etsy. 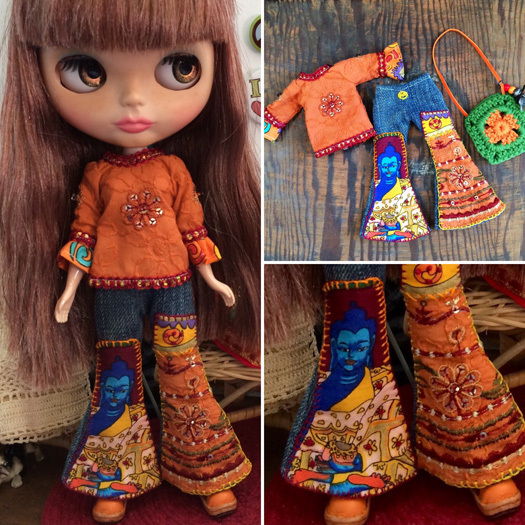 Your jeans are amazing and the embroidery work is lovely and so dimensional. A great article and very interesting… a unique talent. Hello from the UK! 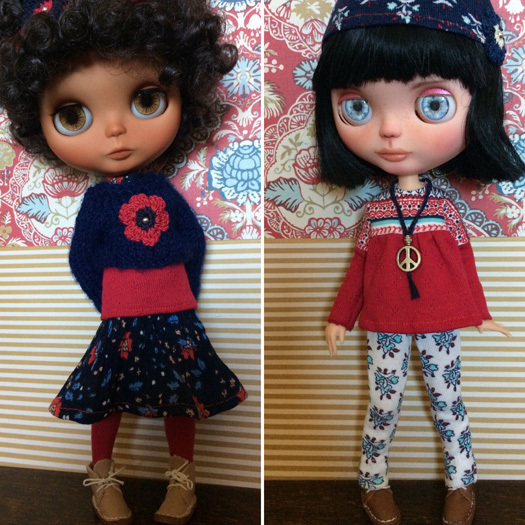 I love your outfits and the peace necklaces, they look fabulous on Blythe ? These jeans are so cool. I used to create my own jeans like this in high school so I feel nostalgic looking at them. I remember the 70’s! Hi, neighbour! Nice to see more Canadian talent! I have been a fan of Florance’s for awhile! Her etsy shop always has the cutest things. Thanks for a really insightful interview! 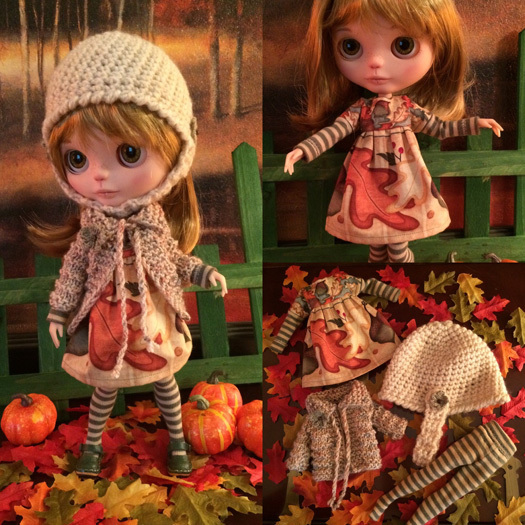 I’ve enjoyed getting to know the person behind these adorable clothes; she’s as lovely as her outfits are. Those are adorable! 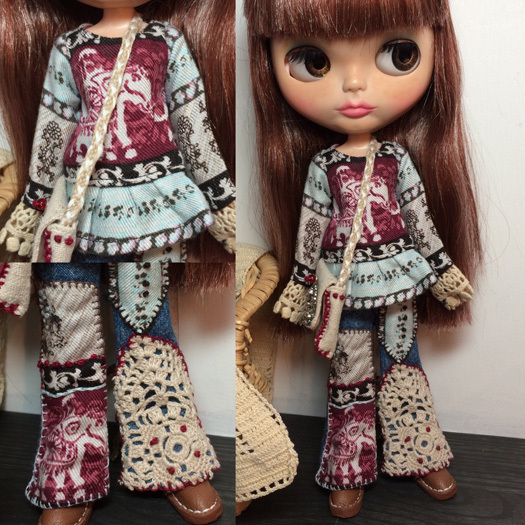 I love all the details, and who doesn’t like flared jeans! I love all the little details in your outfits, especially how you incorporate hand-knitted items that are look light and scale-appropriate. Enjoyed this post very much! This interview with Florance was marvelous! 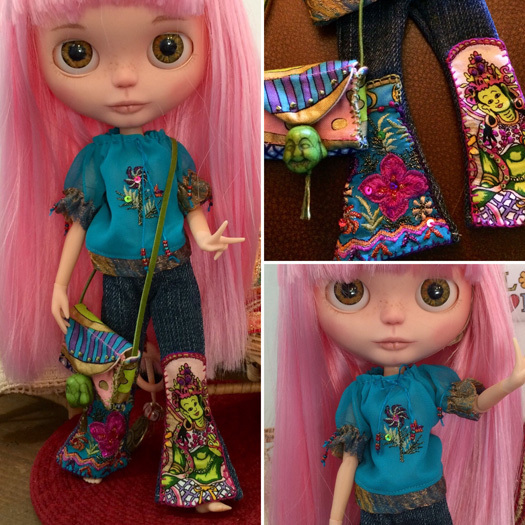 I enjoyed learning more about her and her passion for designing and creating some of the most amazing Blythe fashions! I appreciate this chance to win one of these wonderful outfits! Thank you! Lovely read! Always fun to learn an artist’s process! Beautiful and generous giveaway as well ? The trousers this talented seamstress creates, always bring a smile to my face. Great interview and thanks for sharing! Those jeans are amazing! So creative! I love your background story as well as your design aesthetics. Thanks for sharing! Cool! Her outfits are so beautiful and unique! Such beautiful, unique outfits. I love them. I love it! Such beautiful outfits! I have know Florance for quite a few years now, when she had her shop. 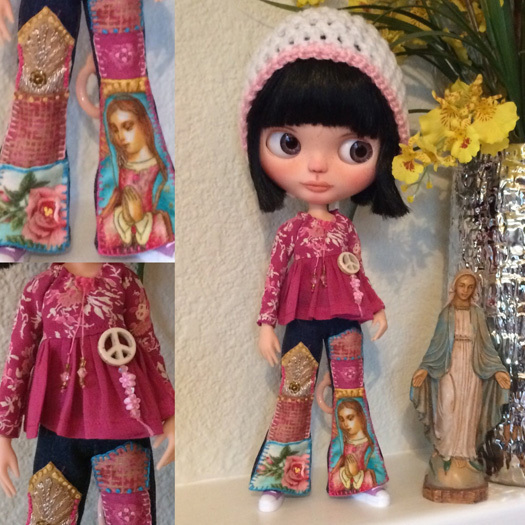 I saw her “adult” sized fabulous jeans and jackets and the same for kids, totally amazing and now she is making them for dolls! 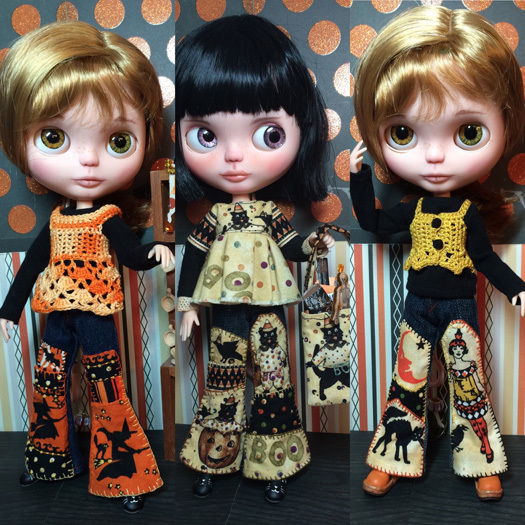 Totally blew me away with her wee creations. They are even more delightful in person. Anyone would be soooo lucky to win this outfit!!! it will last forever. Thanks for interviewing her Michelle. Great job. This set is georgeous!thanks for the chance! 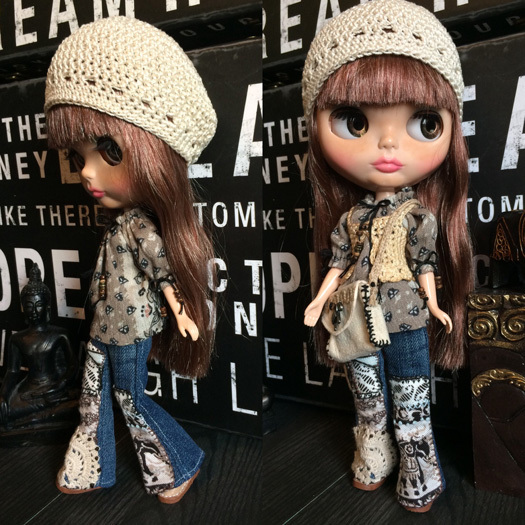 I just love things that are unique and different and these jeans are definitely that! What a great idea! How adorable are they, will definitely be looking this talented person up on etsy thanks for the chance. 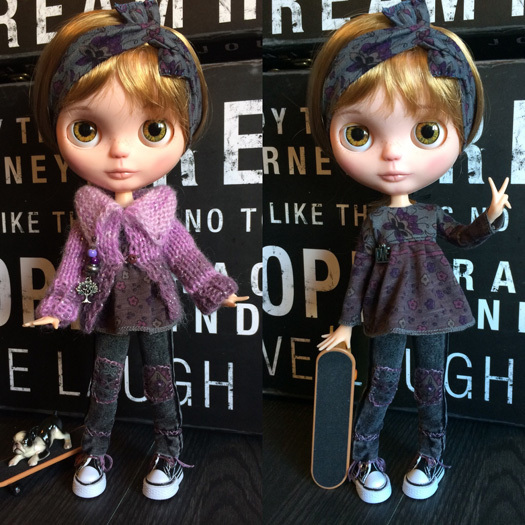 Jeans are definitely one of my favourite items of clothing for myself and also when it comes to dress up my dolls. I only just discovered your page and I think I’m going to have to get a pair of those!! Love the colours and designs!! Keep up the great work! Your work is amazing. Keep it up.. Great interview..